I have quotes from other solar contractors. Will you match their costs? Will I own my solar electric system? Will I still have electricity at night or when it is cloudy outside? What if there's a blackout? If I buy another property can I apply for a solar system for the second property? How many panels will I get? Can I add panels to my system? What happens if I have some unpermitted work on my house? What if I need to do work on my roof? Do I need to have Internet access to go solar with GRID? Your savings will vary depending on the state you live in, the size and position of your roof, and how energy-efficient your lifestyle is. The solar electric systems GRID Alternatives installs typically reduce electric bills by 50-90%. GRID Alternatives leverages multiple funding sources, including government incentives, manufacturer partnerships and fundraising to bring the benefits of solar to eligible families. GRID’s program is also an inclusive and participatory process, where everyone involved helps empower a home, a community, and our environment. Eligible families do not pay anything to receive solar through GRID but are invited and encouraged to participate in this community effort. Please contact your local GRID Alternatives office for details. There are many different for-profit solar contractors with different payment models, but no solar company costs you less than GRID. GRID Alternatives is a nonprofit community organization that connects families with government programs that provide solar at no cost to eligible homeowners. We pay for your solar system, so going solar with GRID will always cost you less. Some projects are owned by the homeowner while others are owned by a third party. 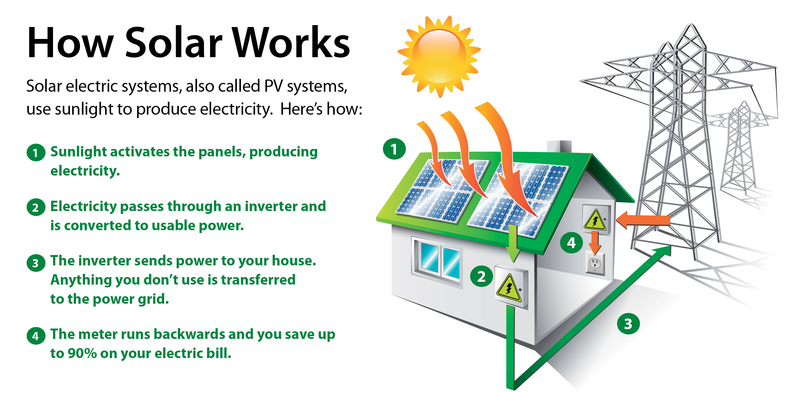 Who owns the solar electric system depends on the program and available funding in your area. Once you qualify, a GRID staff member will inform you whether your system will be owned by you or a third-party. GRID Alternatives can bring more dollars to your project by using a third-party ownership model. This model allows GRID to access the Federal Investment Tax Credit (ITC) and tax depreciation. Here’s how it works: A third-party (not you or GRID Alternatives) owns the system on your property, and grants you a 20-year lease. You receive the benefits of the system, which includes all the electricity it generates, and a 20-year system maintenance and service warranty. GRID pays up-front for the entire cost of the lease, at a price that is reduced by the tax credits the owner receives. GRID still installs your system and is your point of contact for the whole installation process and lease period. Please contact your local GRID Alternatives office for details. Yes. The system will produce most of the electricity you use, but not all of it. You will have a lower electricity bill, and will still need to pay your gas bill. Yes. You will still be connected to the electrical grid, so your electricity will work the same way that it works now. What if there’s a blackout? Because the system has no battery storage, you will not have power during a blackout/power outage. After a blackout, you might have to turn your system back on. The panels are covered by a 25-year warranty, and last between 30 and 40 years. The inverter is covered by a 10-15-year warranty and may need to be replaced during the lifetime of the solar system. Micro-inverters are covered by a warranty of 15-25 years. GRID Alternatives provides a 10-year labor warranty. In the third-party ownership model, all of the maintenance, including part replacement, is covered for 20 years. You need to clean the solar panels with water when they get dirty, typically twice a year. Make sure your trees, satellite dishes, etc. don’t shade the panels. Regularly check your inverter and monitor system performance. Learn more. You can sell your property at any time. If you are leasing your system under our third party ownership model, the agreement you signed must get transferred to the new homebuyer. Please inform GRID Alternatives that you are selling your property and provide contact information of the new homebuyer. Yes! Research has found that buyers are willing to pay more for a home that has solar on it. Additional information can be found in this New York Times article, the Lawrence Berkeley National Laboratory, Department of Energy, and a report by the National Bureau of Economic Research. No. GRID Alternatives will only install a solar system on your primary residence. However, if you move, you may be able to apply. This depends on several factors, such as your electrical usage, size and orientation of your roof. We design your system for your home and your energy usage to ensure you get the most savings possible. Adding panels to your system will void the warranty on the equipment. GRID Alternatives will not add any additional panels to your system. Inform your Outreach Coordinator. Your project may need to be placed on hold until all work on your house has been permitted. Code violations can prevent us from getting your project approved by the local jurisdiction. If the current condition of your roof is not suitable for installation of a solar system GRID Alternatives will need to place your project on hold. Once your roof has been fixed, please inform your Outreach Coordinator to discuss continuing your project. GRID Alternatives is not available to conduct roof work or provide any funding for roof repairs. Internet access is very helpful for monitoring your solar energy system, but it is not required. GRID's Energy for All Program provides NO-COST solar for families with low to moderate incomes. You can save up to 90% on your electricity bills! "I'm going to save energy and save money. We never even thought we'd be able to have our own home. And I love that I got to help put the panels on. I didn't get to help build my house, but I helped with this."